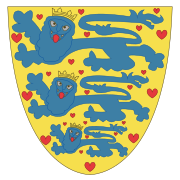 The name of the Estridsen dynasty recalls their acquisition of the Danish crown through the marriage of Ulf the Earl to Estrid Svendsdatter of the House of Knýtlinga, daughter of Sweyn Forkbeard and sister of Cnut the Great. Later genealogies trace the family from Jomsviking leader Styrbjörn the Strong, a scion of the Swedish royal family, who are in turn given a descent from legendary King Sigurd Hring, regarded as mythical by most modern historians. The reliable ancestry traces no earlier than Ulf's own father, the obscure Thorgil Sprakling and the grandfather Björn (in sources named as Ursius).